There have been some stressful things happening to people I love lately, and then those stupid Facebook memories (which I love) reminded me of someone who died too young. It's been a rough few weeks. Let's talk about what's making me happy. That appearance at the end?!? WHAT?!? Last I heard, Marvel didn't have movie rights for that character!!?!?! Mind. Blown. Vancouver hosted its first Rugby Sevens tournament. By all accounts, it was a success. 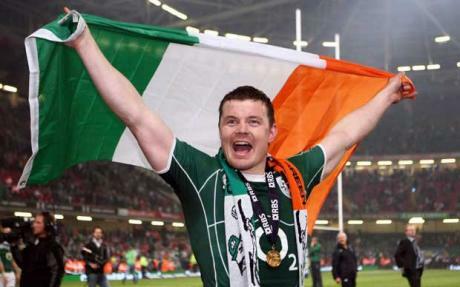 Plus, it meant that Brian O'Driscoll was in Vancouver. I love that man. I seriously considered heading to Vancouver for the weekend to see if I could spot him. The man was a legend on the Irish Rugby team. I didn't go to Vancouver, however, because stressful things happening to people I love. I know awesome people who are doing awesome things. Cely and her sister are raising money for the Leukemia and Lymphoma Society (I linked to the Canada page because they also do Team-in-Training) with an epic bike ride. My cousin, David, is raising money for Mencap by running a marathon. And yes, I did just shamelessly link to both of their fundraising pages. When it comes to good people doing good things, I have pretty much no shame. I went to see The Bills on Friday night with my stepmom. It was their CD release party for Victoria as well as a fundraiser for UVic's Continuing Studies division. The funds raised are going towards sponsoring a refugee family from Syria. I love the Bills and it was a fantastic evening of entertainment. I'll be watching it and practicing my insults as I bake my Guinness Chocolate Cupcakes with Bailey's Cream Cheese icing tonight!